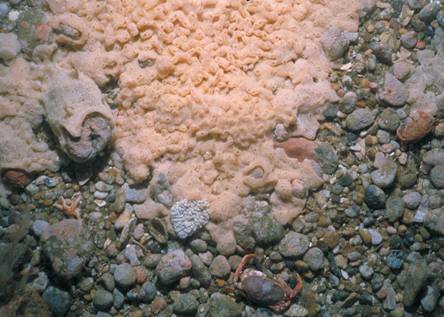 Photos (from top): (1) Sea squirts taken from a colony on the seafloor off the New England coast; (2) thousands of individual sea squirts create a dense cover over the ocean floor, crowding out and smothering native species such as sea scallops and other organisms that are an important part of this North Atlantic fishery; (3) tunicate colonies can also take on a spongy, branch-like form when they become encrusted on surfaces or objects other than the sea floor. Identification: In his book The Ancestor’s Tale, Richard Dawkins describes the typical sea squirt as “a bag filled with sea water, plus a gut and reproductive organs anchored to a rock.” Didemnum live in large, mat-like colonies that encrust the rocky or gravelly surface of a seabed. Such colonies may include many thousands of individuals, whose color range from pale pink to yellow and orange. Colonies are also found similarly affixed to other surfaces, such as underwater rock outcroppings, ship hulls and docks. 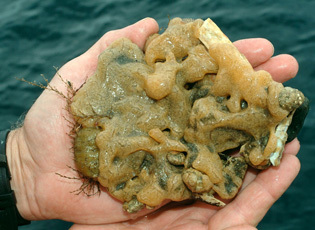 Didemnum have a sponge-like appearance, often with “appendages” that poke out here and there from individuals in the colony. More generally, sea squirts – which comprise their own subphylum – are known as “tunicates,” for the soft, flexible, tunic-like covering they develop as adults. Original Distribution: The original distribution of Didemnum and other tunicate species is in dispute. Some scientist now believe that certain species thought to be native to Europe and the Americas are actually invasive species that arrived centuries ago. Current Distribution: Several species of the genus Didemnum, including Didemnum lahillei and Didemnum vexillum, have invaded coastal waters off New England, California, the Pacific Northwest and as far away as New Zealand. The populations along the coastal U.S. from Maine to Long Island, and in the Pacific, have been growing rapidly. Site and Date of Introduction: Didemnum vexillum was documented in the coastal waters of California in 1998. Two years later, the species was found in coastal New England. More recently, a large colony – a mat covering 6.5 square miles -- was found further offshore, approximately 160 miles from Cape Cod on the Georges Bank, some 150 feet below the water’s surface. It is presumed, based on anecdotal evidence, that the species arrived in New England waters in the mid-1990s. 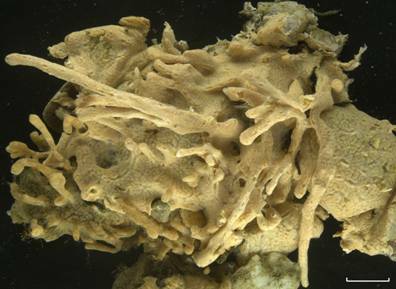 A closely related tunicate species was also discovered in New Zealand waters in 2001. Some species are thought to have arrived in North American waters in the 1970s. Mode(s) of Introduction: Ballast water, ship hulls and fishing equipment are presumed to be the mode of introduction for most species. In addition, pieces of sea squirt colonies, which may contain larva, have also been known to break away from the larger colony. Such fragments may move through the water indefinitely and then reproduce asexually, creating another possible route for local introduction. Benefit(s): Researchers have found that sea squirts are a rich source of bioactive chemicals – which serve as a defense against other marine organisms that might want to eat them. Threat(s): Invasive species of sea squirts, notably of the genus Didemnum, pose a threat to important fisheries and aquaculture. The dense colonies formed by these organisms can overrun and alter the marine habitats of many other species, including scallops, mussels, oysters and sponges. Control Method: A control method, or formal management policy, has not yet been determined. Currently, a number of studies are underway to monitor changes in the distribution and abundance of Didemnum, better understand the physical and biological needs of this genus, and study the impact documented colonies are having on native species. Fisherman are being encouraged to report sightings of tunicates to the U.S. Geological Survey or other research institutions. At a scientific conference in April 2005, three researchers proposed potential strategies for controlling Didemnum, including “induced environmental stress” in the form of exposing the organisms to air or temperatures that would be enough to kill. “Invasive Marine Species Found on Georges Bank (Nov 19, 2003),” National Oceanic and Atmospheric Administration.